You are here: Home>Archive>Days of Pride Collection.>Collection of items relating to Arthur Lewis Lloyd.>Copy of a page from a war diary. Copy of a page from a war diary. 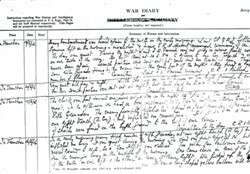 Copy of a page from a War Diary (Army Form C.2118) from the trenches 13 – 16 June 1916. 4 copies.